With Pyramids of the Lost King moving along nicely and the existence of my now broken wrist I have turned my attention to one of the possible stretch goals for the Kickstarter. Since my wrist is broken my ability to type has been greatly reduced because the angle my hand is stuck at in the not-a-cast I was given. So for the moment the more writing intensive stretch goals are on a side-burner and I'm working on learning how to do the more difficult (and also final stretch goal): VTT versions of the kickstarter adventure. For this I've chosen the two largest platforms for online play Fantasy Grounds (also on Steam) and Roll20. I also plan to eventually create the adventure in Tabletop Connect after it is officially released and figure out if there is anyway to make it native in Hangouts. 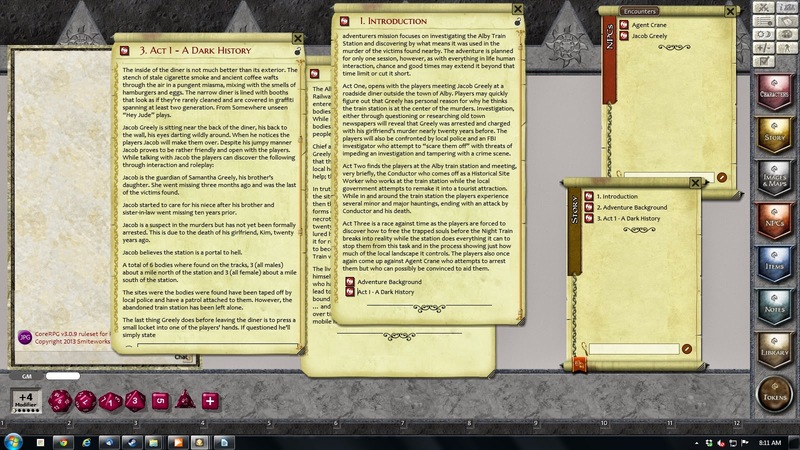 So far I am enjoying the learning process, especially on Fantasy Grounds which has become the core focus of my education. For this education I am using a previous Patron Adventure "The Coming of the Night Train". Depending on how this goes the VTT version will be given away to my Patrons and placed up for sale as well to my non-Patrons to help fund Pyramid of the Lost King. So, wish me luck in this learning process and if anyone has Fantasy Grounds and would like to help me test various builds please let me know!